A leading figure in the study and codification of professional ethics in social work, Frederic (Rick) Reamer, Ph.D. '78, is the winner of the 2005 Edith Abbott Award. Reamer, a professor in the graduate program at the School of Social Work, Rhode Island College, chaired the national taskforce that wrote a major revision of the Code of Ethics of the National Association of Social Workers (NASW). The code, adopted in 1996, is the first to provide practicing social workers with clear, practical advice on "boundary issues" in their work. 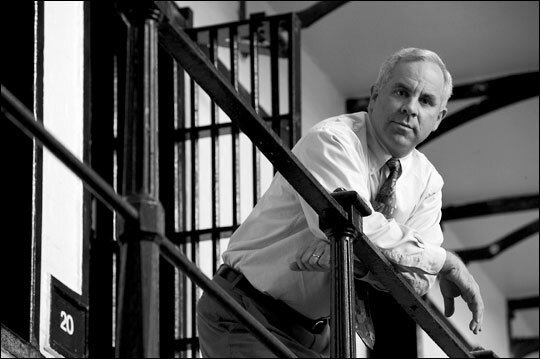 Reamer's distinguished career has also included research and practice in criminal justice and social work education. The Edith Abbott Award is presented by the Alumni Association of the School of Social Service Administration every other year to an alumnus for distinguished service to society and outstanding professional contributions at the local, national or international levels. The award honors exceptional leadership and has among its criteria a consistently high level of achievement through a long career. It is fitting that Reamer received this award as SSA marked the 85th anniversary of its doctoral program. "I can pinpoint, almost to the day, when my interest in the daunting ethical issues in the social work profession began, and it was when I was a doctoral student at 969 East 60th Street. I was focusing on the criminal justice system, and I thought, 'There must be a lot of complicated ethical issues in this type of social work.' It was like a light-bulb went off," Reamer said. Among the first academics to study the ethical dimensions of social work, Reamer's work on the Code of Ethics earned him NASW's Presidential Award in 1997. His books on the topic include Ethical Standards in Social Work and The Social Work Ethics Audit, among others. He has lectured extensively on ethics and social work and has served as an expert witness in trials around the country. Reamer has continued his interest in criminal justice, including serving as director of the National Juvenile Justice Assessment Center and as a Parole Board Member in Rhode Island. He has sat on many editorial and editorial review boards and was editor-in-chief of the Journal of Social Work Education from 1990 to 1994. In a letter supporting Reamer for the Abbott Award, Charles Shireman, Professor Emeritus at SSA, wrote, "His primary interest remains, as it has always been, contribution to the richness of human relationships. This is the essence of social work. I can think of no one for whom the Edith Abbott Award would be more appropriate." Reamer cites Shireman, Irving Spergel, Don Pappenfort, and John Schuerman as influences and "part of the marrow of SSA" when he was at the School. Because social work's inquiry into ethical issues from an academic point of view was in its infancy when Reamer was at SSA, he took many courses across the Midway in the philosophy department while pursuing his Ph.D., and he credits SSA's interdisciplinary focus as providing an opportunity to begin his exploration of the ethical dimensions of social work. "At the University of Chicago, you didn't just learn lots of facts," Reamer said. "You learned how to think critically and how to analyze ideas. My time at the school provided a terrific intellectual challenge."